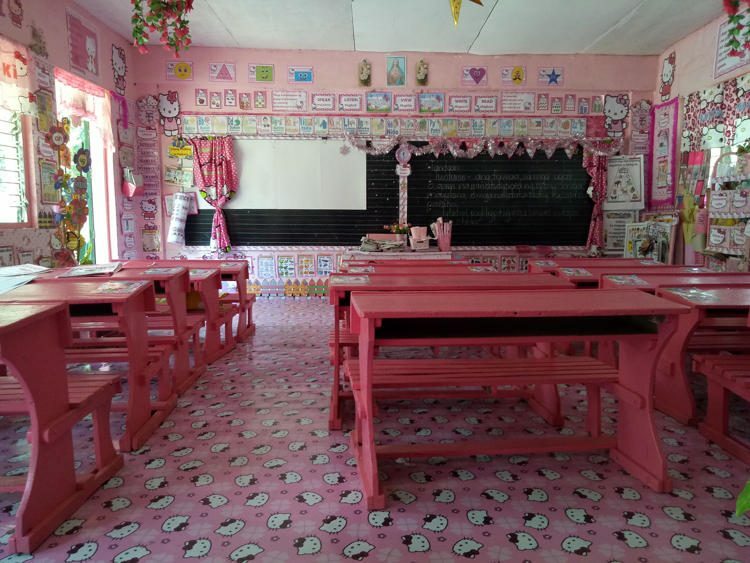 Samelyn Lafuente, a young primary school teacher from Masbate City, in the Philippines, spent the last three years turning a bland classroom into a little girl’s real-life fantasy, decked in pink and full of Hello Kitty-themed decorations. Walking into Samelyn Lafuente’s classroom, you would be tempted to think that it’s an obsessed Hello Kitty fan’s shrine to the popular Japanese character. The floor is covered with a Hello Kitty-themed carpet, the walls are all pink, as are the school desks, and there are Hello Kitty decorations everywhere, hanging from the ceiling, plastered on the walls and even in the windows. It would be fair to assume that parents of little girls in Ms. Lafuente’s class must be struggling to pull them away from this real-life fantasy in pink every day, which is just what the teacher planned all along – to create a place where her students would be happy and enjoy their time at school. Covered by climbing plants and surrounded by a garden of eucalyptus, palms, olive trees and cypresses, this old cement factory on the outskirts of Barcelona looks like an abandoned industrial complex reclaimed by nature. In reality, it’s a bustling work/living space designed by Spanish architect Ricardo Bofill. 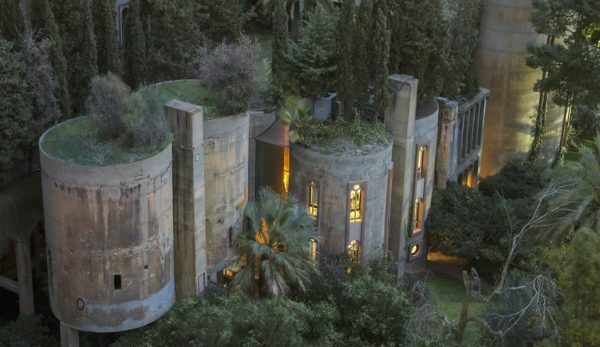 Bofill discovered the closed down World War I cement factory in 1973, and was immediately drawn to it. He and his team bought the entire complex consisting of over 30 silos, subterranean galleries and huge machine rooms and convert it into the head of office of Taller de Arquitectura. They spent two years demolishing dilapidated structures and remodeling those worth converting. When the dust settled, only eight silos remained, which became offices, a models laboratory, archives, a library, a projections room, a gigantic exhibition space known as “The Cathedral” and a residential space for Bofill. Three years ago, Brian Sullivan and his wife Starla lived in a rented apartment that cost them $1,500 a month plus utilities. At one point they decided it wasn’t worth it anymore, so they bought an old school bus and turned into a comfy home for their big family. It was in March 2014 that 29-year-old Brian and his wife Starla, 26, of Renton, Washington, got tired of wasting so much money on rent. The apartment was over an hour away from Brian’s workplace, and he had to work overtime just so they could afford the rent. Plus, they wanted to be homeowners and spent a lot of time watching YouTube videos of people building their own tiny houses, or converting all kinds of things into comfortable living spaces. 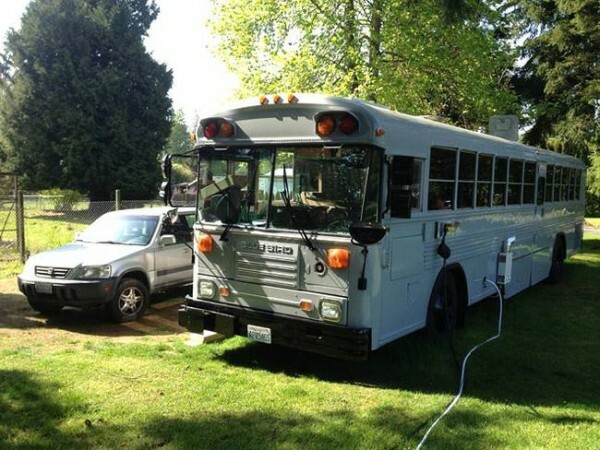 It was one of these videos that convinced them to take a leap of faith, so in April 2014, they bought a disused school bus for $2,800, and spent another $30,000 turning it into a home for their three kids. 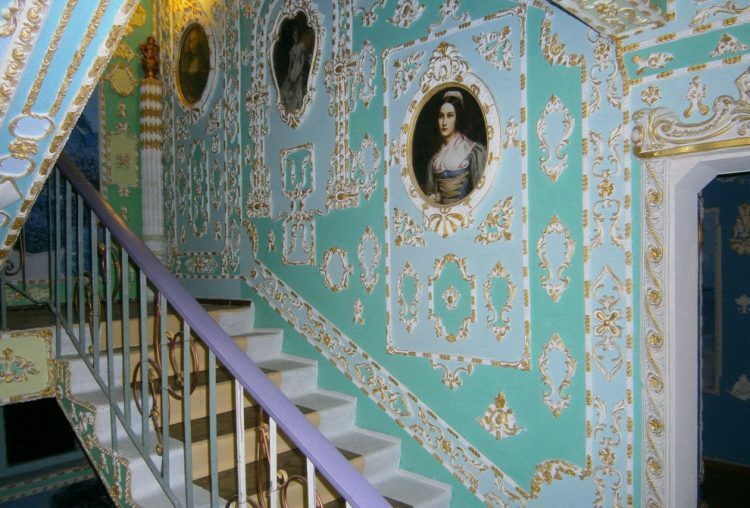 Vladimir Chaika, a pensioner from the Ukrainian city of Kiev, spent 15 years turning the staircase of his Communist era apartment building into an artistic masterpiece reminiscent of 17th and 18th century chateaus. Vladimir says that he had always been fascinated by the interior design style of 1600s and 1700s castles and estates, and having worked in constructions for many years, repairing various structures around Kiev, he had the skill and experience needed to undertake such a complicated project. 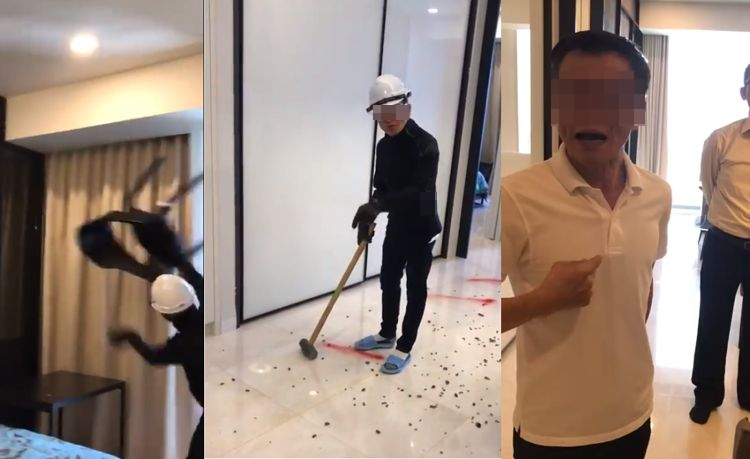 It was time that he lacked, but following an accident that left him clinically dead in 1997, he was forced to retire and ended up with a lot of free time on his hands. He was very familiar with the decorating style of 17th century French chateaus, construction materials were cheap, and after asking a friend to supply him with a variety of custom molds, he was ready to get to work. Fashion Model Summer Rayne Oakes has been living in a 1,200-square-foot converted industrial space in Williamsburg, Brooklyn, for 11 years, and during in that time she has managed to turn it into a stunning oasis filled with 500 plants, including a living wall, an irrigated vertical garden, a closet garden, edibles and exotic species. 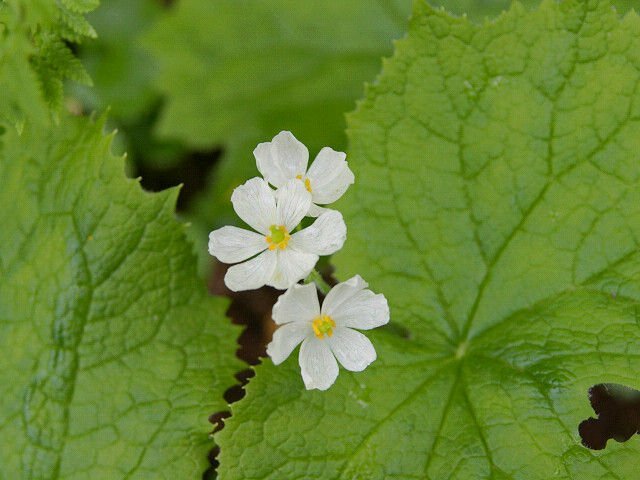 “I think that the only way I’ve really been able to survive in New York is by surrounding myself with plants,” Oakes told Modern Farmer Magazine, which makes sense considering she grew up in a country house on five acres of land in rural northeastern Pennsylvania, surrounded by domestic animals and lots of plants. It was fashion modelling that first brought her to the Big Apple, but that, and everything else she has been involved in since relocating to the big city, has been about raising awareness to the environment. Jarvis Chimenes Pavao, considered one of the most dangerous drug traffickers in South America, was serving an 8-year sentence in Tacumbu Prison, when police raided his cell to find it was actually a luxury suite. Pavao was due to complete his sentence for money laundering next year, at which point he was likely to face extradition to his home country of Brazil, but Paraguayan police recently learned that he planned to escape by blowing a hole in the prison wall. 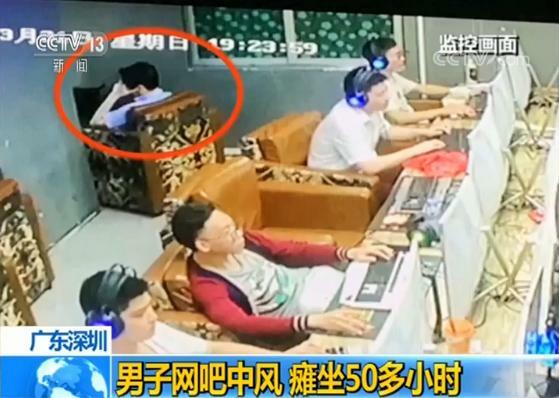 To prevent Pavao from pulling an “El Chapo”, they raided his cell only to find that instead of an austere room, he was living in a luxurious three-room suite complete with air-conditioning, private bathroom, conference room, kitchen, library and multiple flat-screen TVs. Grandmas are usually proud of you even if you so much as sneeze, but this North Carolina woman has taken granny-love to a whole new level. 66-year-old retiree Carmen Baugh is so enamoured with her grandkids that she’s converted her living room into a shrine of sorts, with their photographs plastered across the wallpaper, curtains, and even cushions. Carmen got the idea to do up her home with her grandchildren’s faces when she moved from Charlotte to Raleigh. She looked at lots of different wallpaper and curtain samples before deciding to design her own. “My grandson and granddaughter are my pride and joy so why not decorate my home with their faces on?” she asked herself. So instead of just using framed photos of her grandkids, she decided to have a specially-made wallpaper featuring over 30 different photographs of theirs. And she liked it so much that she went on to design a similar fabric for her curtains and cushions, and then used it to make herself a top as well! An apartment that recently went on sale in Magadan city, in northeastern Russia’s Magadan Oblast region, has caught the attention of more than a few prospective buyers. Located on the second floor of a rather ordinary-looking four story building, the apartment is entirely decked up in gold. Well, not real gold, but shiny golden tint designed to give nearly every surface of the interior, including the walls, furnishings, and even bathroom fittings an expensive look! It doesn’t look like much from the outside, but this cylindrical structure is an architectural marvel. It actually used to be an old grain silo from the 1950s, but it’s been transformed a cozy, well-equipped one-bedroom by architect Christoph Kaiser. He now lives in the silo-house – located in Phoenix, Arizona – with his wife. The quirky 340-square-foot home has a very small carbon footprint, but not at the cost of modern comforts. Kaiser, who purchased the silo from a Kansas farmer and transported it to Arizona on a pickup truck, made all sorts of modifications to make it habitable. He added a ten-inch spray foam insulation between the silo walls and the interior walls, and painted the corrugated shell sheet white to reflect the heat of the desert sun. People are generally paid to endorse a brand or display its logo, but one Irishwoman has done the opposite – she’s actually spent several thousands of dollars converting her home into a Coca Cola shrine. Every single room in Lillian’s Glanmire home is done up in the brand’s iconic red and white colors. The Coke logo is splashed across walls and pillow cases, and vintage Coke bottles and cans add to the decor. Lillian explained that her obsession with Coca Cola began over 30 years ago, when she was traveling from Germany to Austria. When she crossed the border between the two countries, she realized that she had been drinking from the same can in two different countries. So she decided to start collecting Coke cans from all over the world. Since 1988, California home builder Peter Cohen has spent over $50,000 converting his Goleta property into a cat haven for his 15 rescue cats. The house now has a series of high walkways, tunnels, ramps and perches designed to make his favorite felines feel comfortable and entirely at home. When Cohen first purchased the house it came with two cats, but one tragically died after it was hit by a car. Soon after, the second cat Cookie was also hit by a vehicle and she had to go through reconstructive surgery to recover. That’s when Cohen decided that Cookie would be a house cat, and he started changing the interiors to her liking. 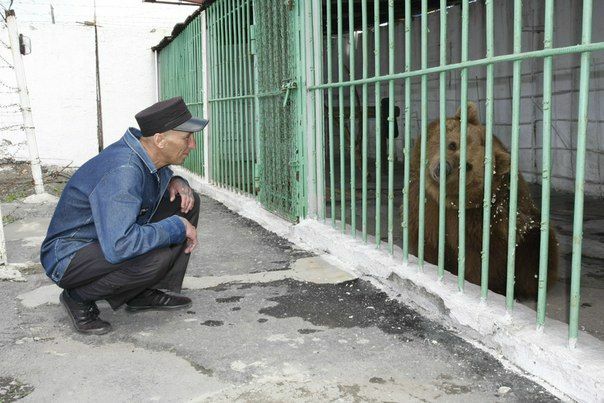 He also went to the shelter to adopt some more cats, so that Cookie could have new friends. 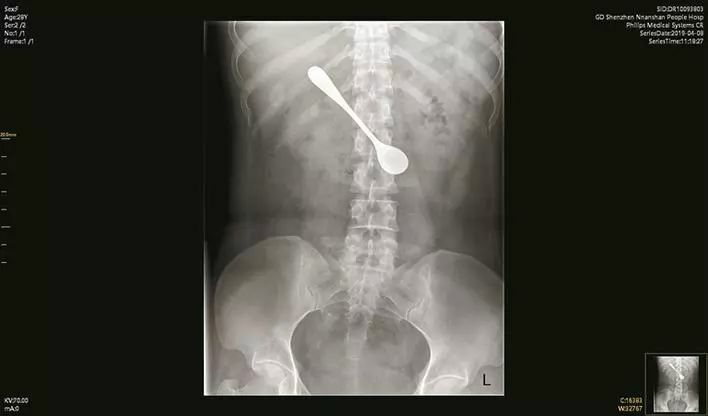 “It sort of went from there,” he explained. A new Mexican restaurant in Guadalajara is making waves for its highly unusual interior. The concept restaurant is named ‘Hueso’ (Spanish for ‘bone’), and true to its name, it uses animal bones as the mainstay of its decor. Mexican architect Ignacio Cadena is the brains behind the beautiful yet haunting design that plays with the sculptural elements of deconstructed skeletons. The exterior or ‘skin’ of the renovated 1940s building is made up of handmade ceramic tiles with zigzag patterns that resemble stitches and sewing patterns. Greg Krueger, from St. James, Minnesota, has spent over 20 years renovating his home – not for his own comfort, but for that of his cats! He’s converted his home into a giant feline playground, with $10,000 worth of elaborate tunnels, platforms, and overhead catwalks. “I just love trails and paths, and cats, of course,” said 50-year-old Krueger. “And so I’ve just linked those passions together.” His unique home improvement project began years ago, when he made a place for his four pet cats to sit on top of a China cabinet, because they liked to be high up. Next, he built a kitty-sized staircase to help them get up to the cabinet. And his cats loved it so much that Krueger just decided to keep going. Soon, he had put up over 100 yards of catwalks and bridges through every room in the house, and set it all up so that his cats never have to touch the floor. Gigi Barker, a British furniture designer and owner of Studio 9191, has come up with a new range of seating that looks and feels a lot like the human body. The seats are designed to mimic bulbous, podgy human flesh. And they’re oddly comforting, as Gigi’s customers reluctantly admit. Although the seats are made of leather – the closest material to human skin that she could find – they’re so oddly shaped that they aren’t instantly recognisable. And that’s exactly the effect that she was hoping to achieve with the project, which she calls ‘A Body of Skin’. Through the project, Gigi wanted to explore people’s reactions to furniture that is strangely familiar to the sight, smell and touch, but not recognisable. “That made the viewers question how to interact with the shapes and to form their own conclusions,” she said.